If you are looking for a salty, crispy snack but don’t want the guilt of potato chips, these Worcestershire Roasted Pumpkin Seeds are perfect. I remember when I was younger, my mom would always roast up the pumpkin seeds leftover after we carved our Halloween pumpkins. I could devour an entire pumpkin’s worth of seeds in about ten minutes back then, and not much has changed. These are quick, easy, and a great way to use up a delicious treat that would otherwise go straight into the garbage. Bring water to a boil. Add 1 tbs. 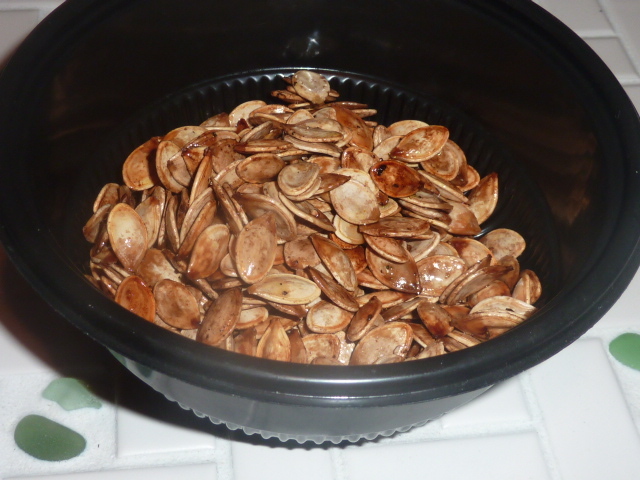 kosher salt and pumpkin seeds and let simmer for 10 minutes. Drain. Cover a baking sheet with tinfoil and place pumpkin seeds in single layer. Toss with olive oil and Worcestershire sauce to evenly coat. Season with kosher salt and freshly cracked black pepper and make sure the seeds are in a uniform layer. Bake seeds on top rack until golden brown, 15-20 minutes, stirring halfway through. Cool seeds completely before storing in an airtight container. I’m a snack person. I like to graze on crackers, cheese, fruits, and veggies throughout the day. However, I rarely will purchase potato chips, crackers and dips, pretzels, etc. – both because of how ridiculously bad for you they are and because of the price. 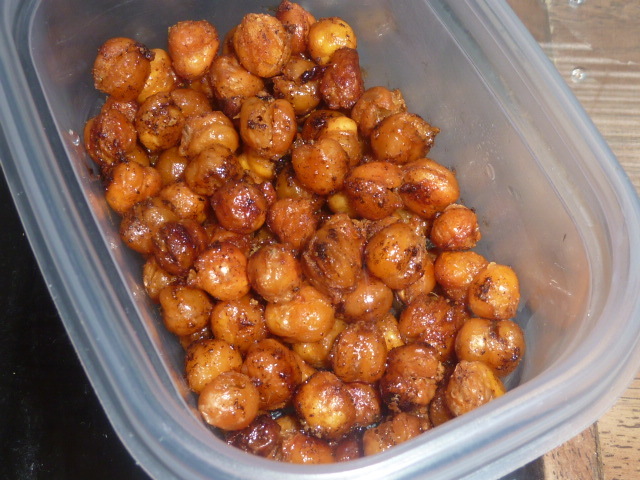 So, when I came across a recipe for Crispy Roasted Chickpeas on The Steamy Kitchen, I was intrigued. I love chickpeas (also known as garbanzo beans) as much for their stand-out nutritional value as their versatility, low price, and delicious taste. This recipe is great because simply by changing the seasonings, you can make basically any snack you’re craving. Want something garlick-y and a bit spicy? This is the recipe for you. Want something different? Substitute seasonings, including dried herbs or dashes of vinegar, as you see fit. I just ate pretty much this entire batch while drinking a beer and watching a football game and I don’t feel at all guilty, as I would have had I been sitting there with a bag of chips otherwise. These would also make a great salad topping or garnish on fish or pasta. Drain and thoroughly rinse chickpeas. Spread on a paper towel and rub well to remove skins. If you don’t get them all, don’t worry about it. Pat gently with a towel to make sure they are completely dry. Cover a baking sheet with tinfoil. Spread chickpeas on the baking sheet. Coat with olive oil. Make sure you use your hands and move the chickpeas around to coat all chickpeas evenly. Add your seasonings. Bake, uncovered, 30-40 minutes until crunchy and cooked through. Check on the chickpeas often and shake the pan around if necessary. Make sure they don’t burn. Remove from oven and let sit until completely cooled before storing.